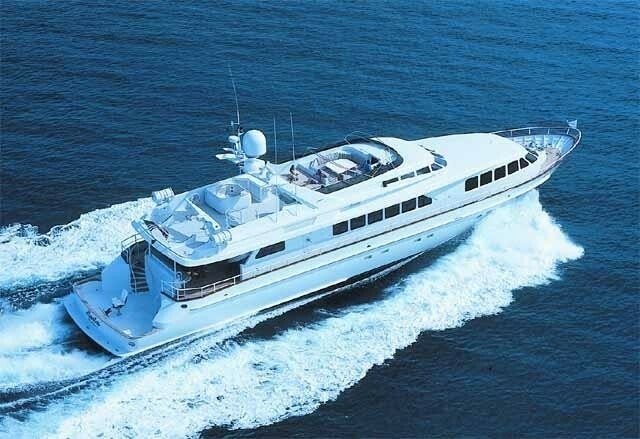 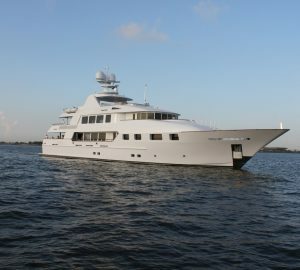 Motor yacht WATERCOLOURS is a 35.05m (115’) yacht built by Trinity Yachts in 1990 and refitted in 2007. 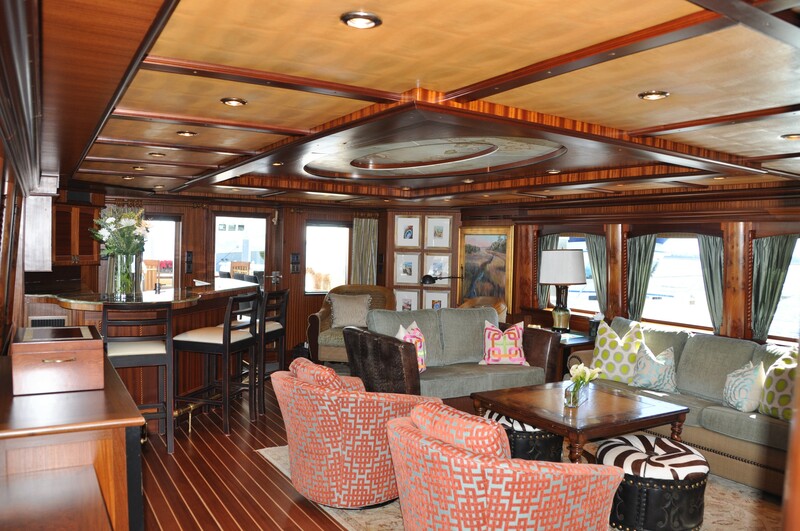 She was Trinity’s Hull number1 and is known for her fabulous outdoor entertaining areas. 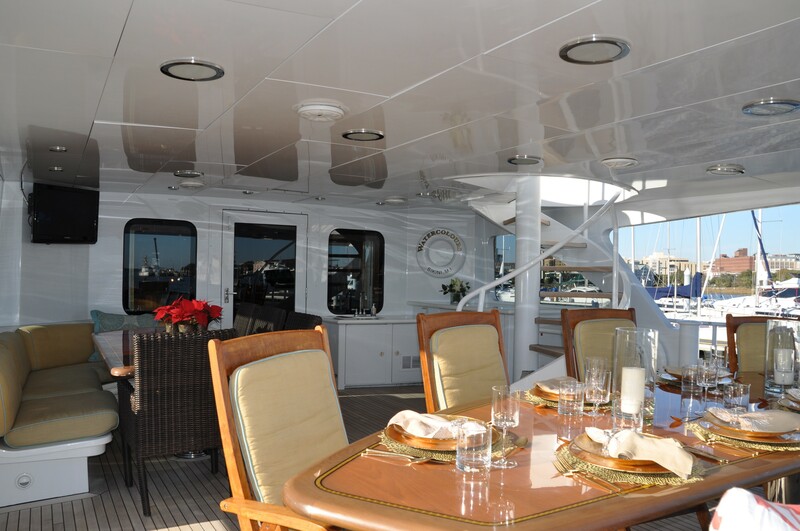 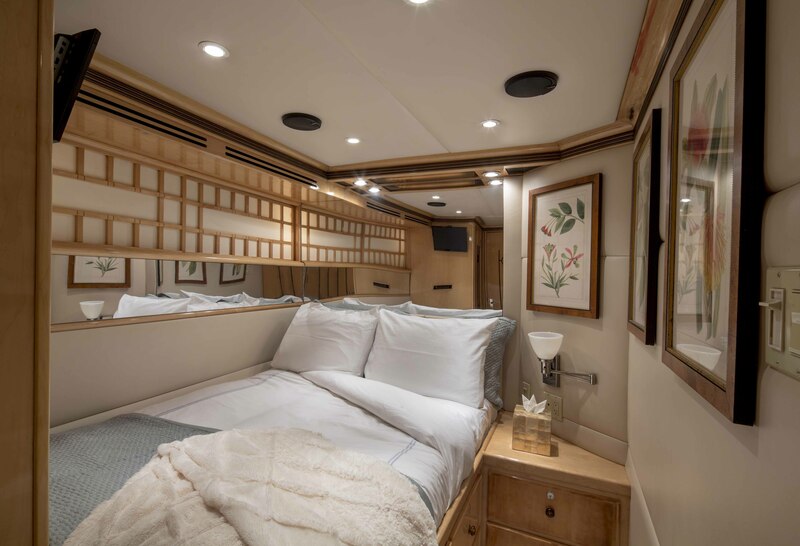 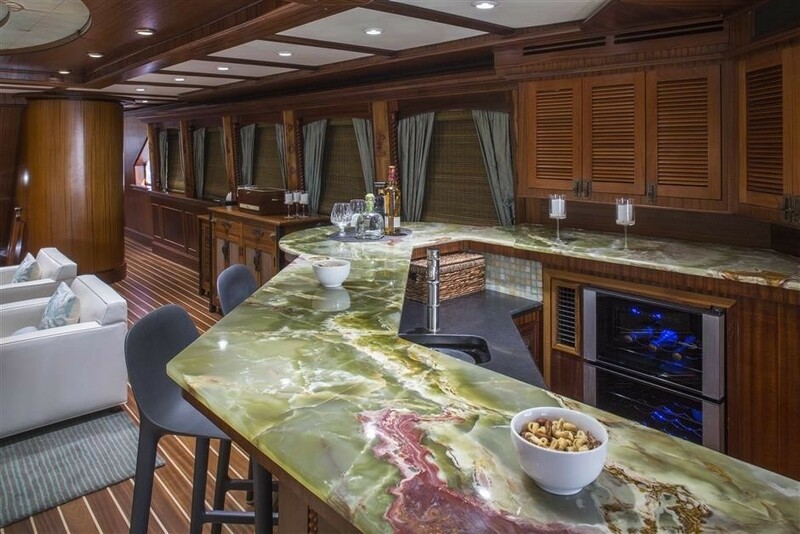 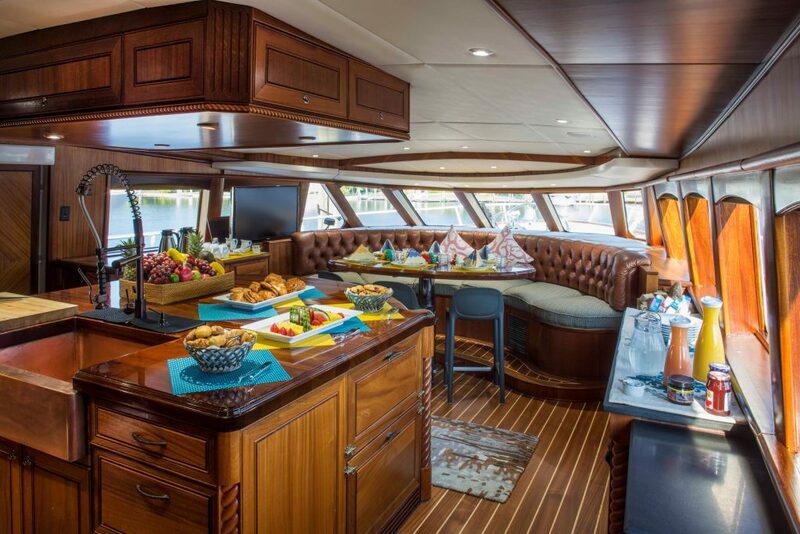 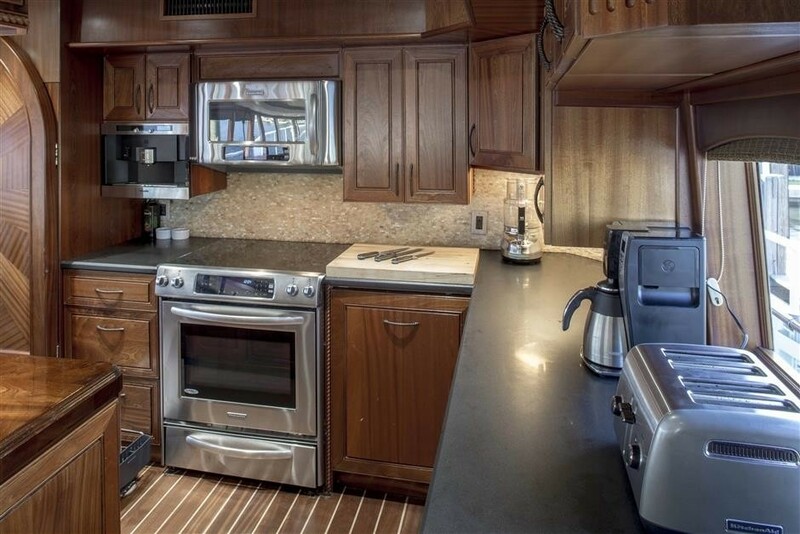 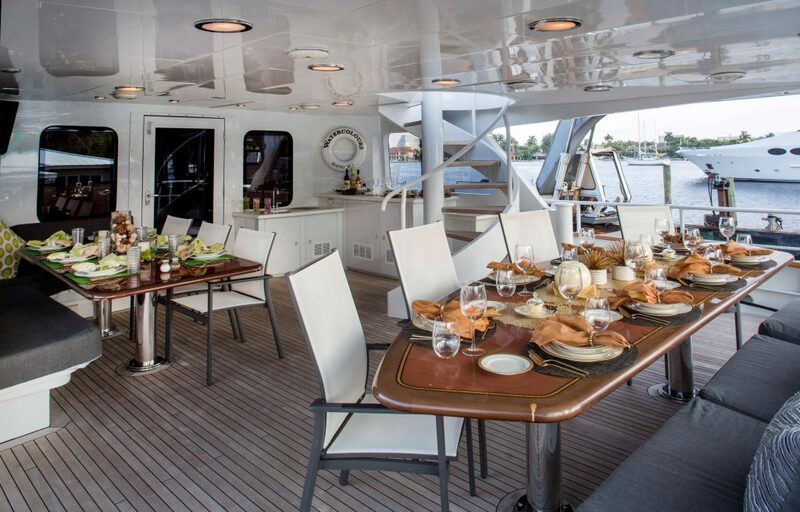 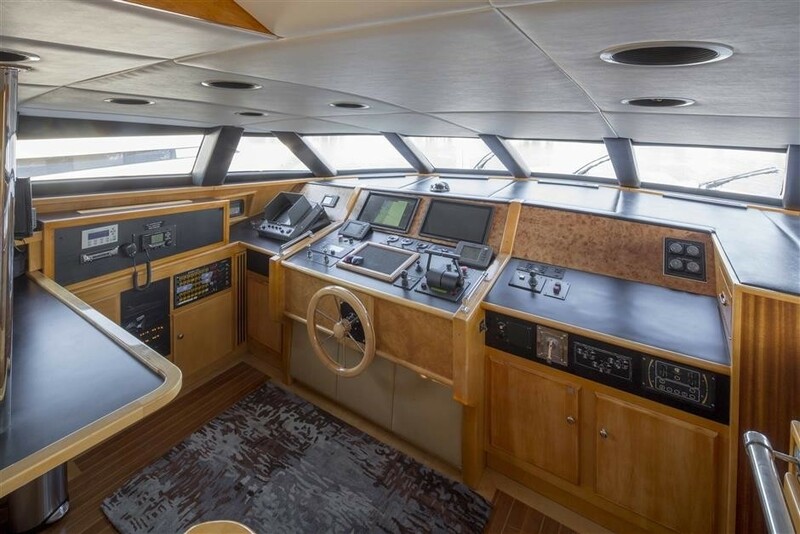 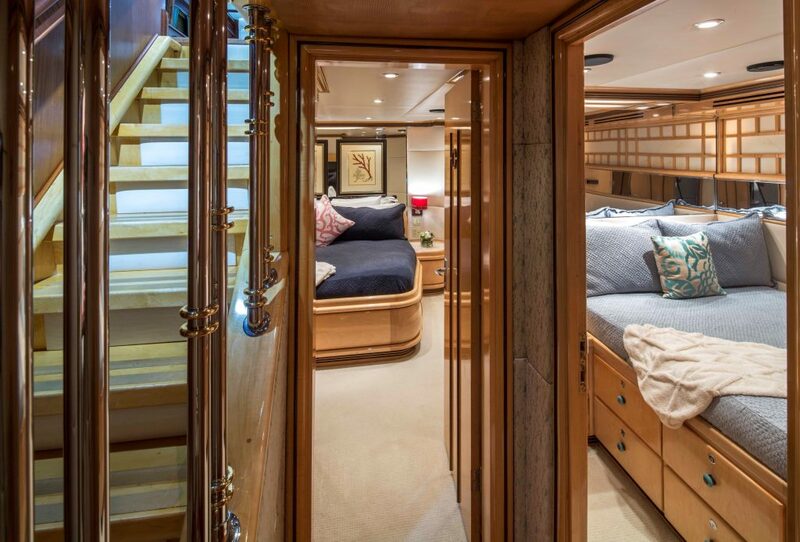 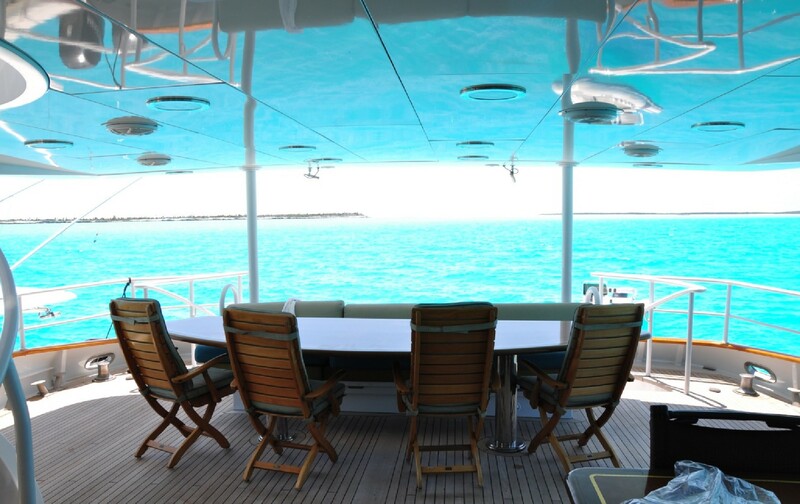 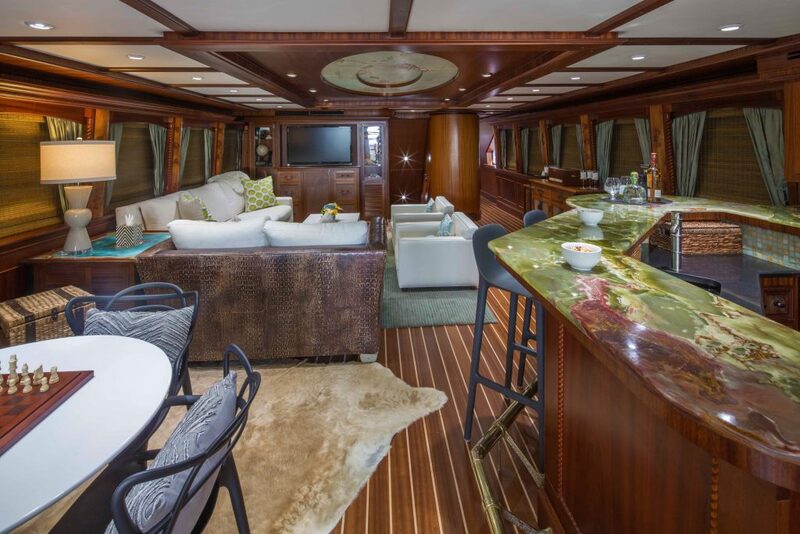 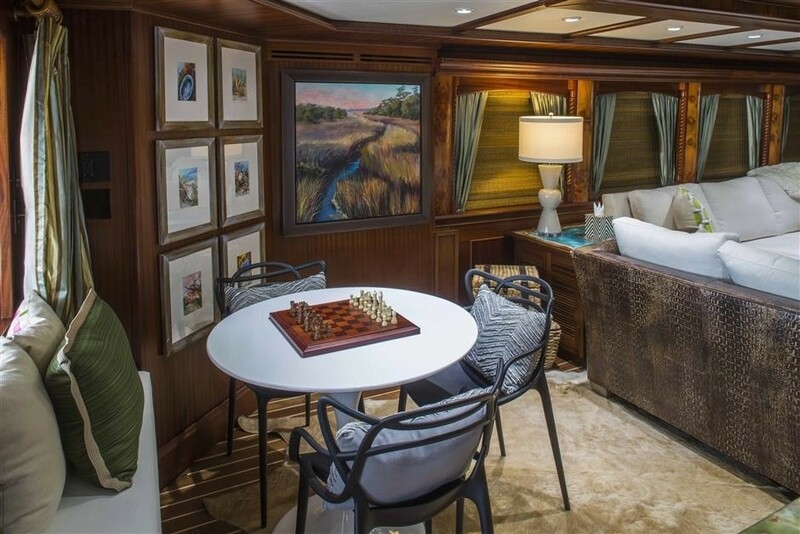 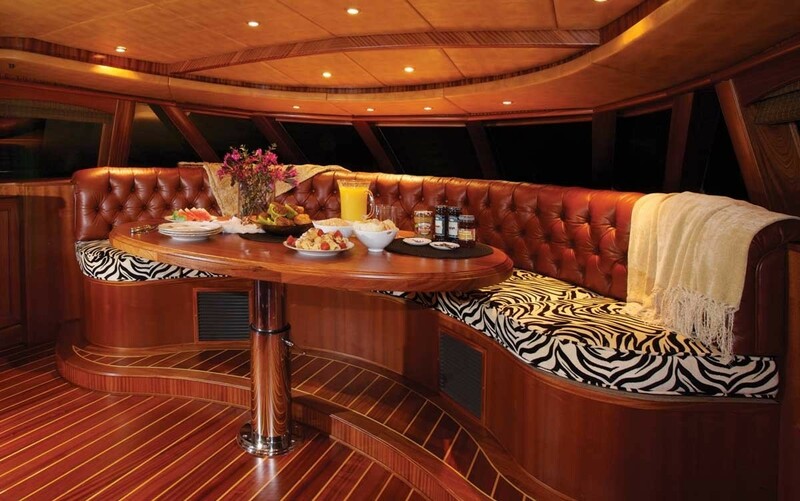 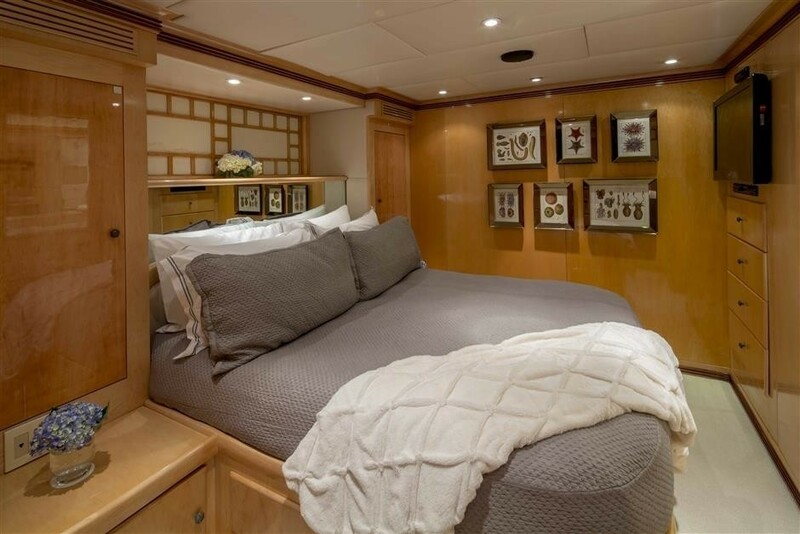 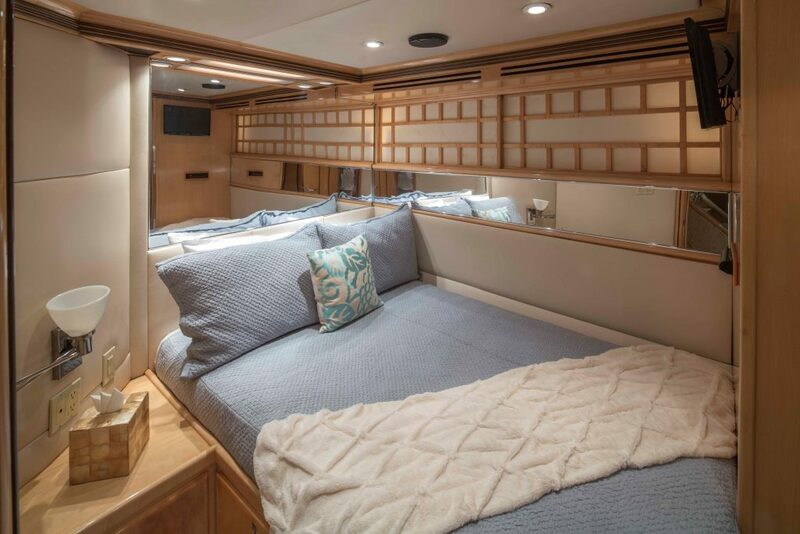 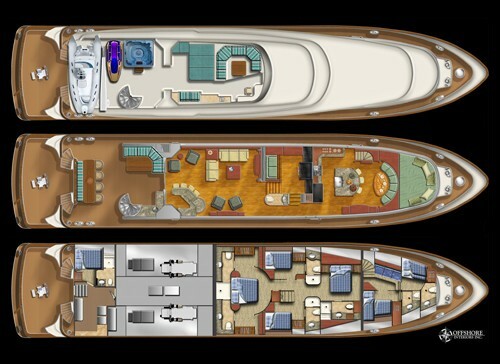 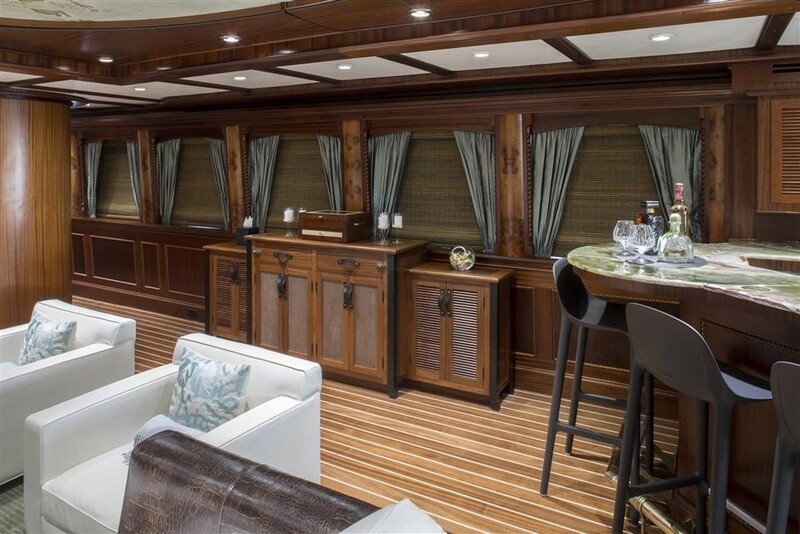 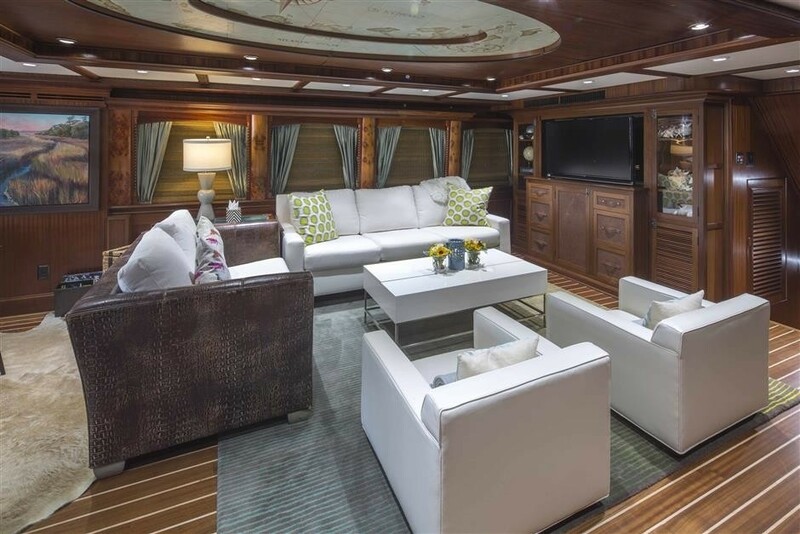 Her covered aft deck features an over-sized al fresco dining area, wet bar, refrigerator, icemaker, a 46” plasma TV and access to cockpit, swim platform and sundeck. 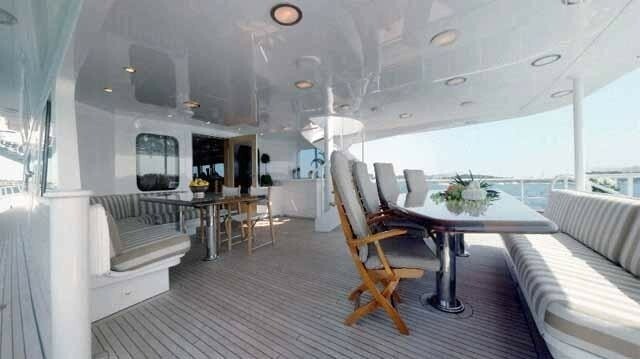 There is a fish fighting Chair fixed on the swim platform. 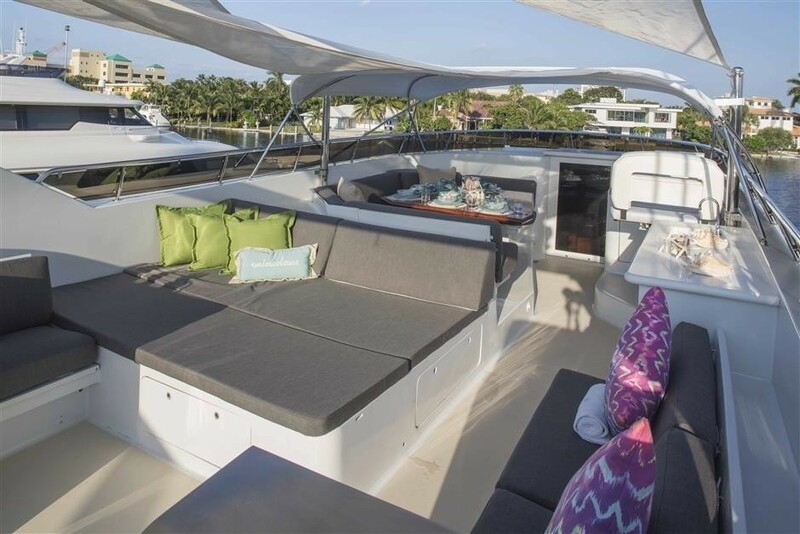 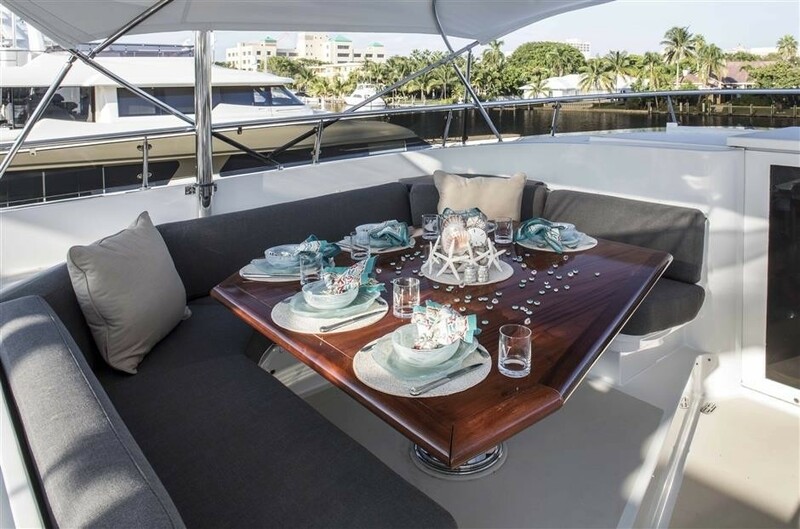 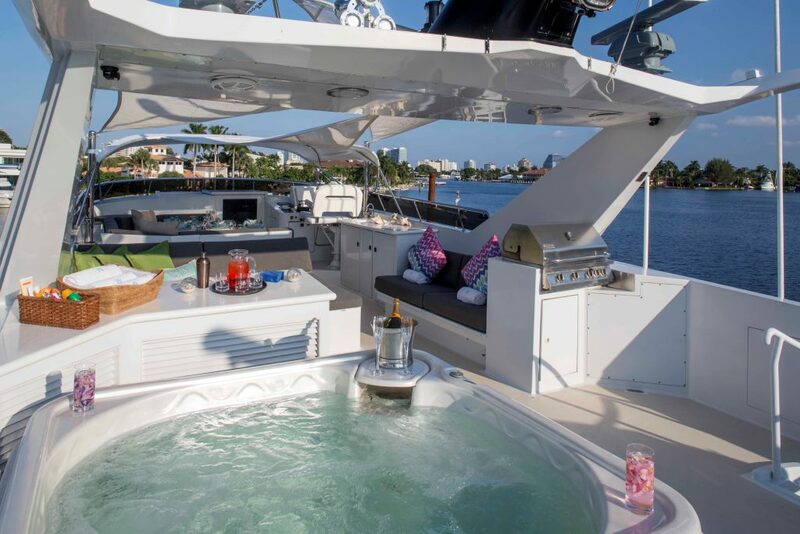 Her sundeck is semi-shaded and features a full wet bar with refrigerator, a Jenn-Aire grill, barstool seating, casual dining, sun pads, an on-deck Spa Pool and helm station. 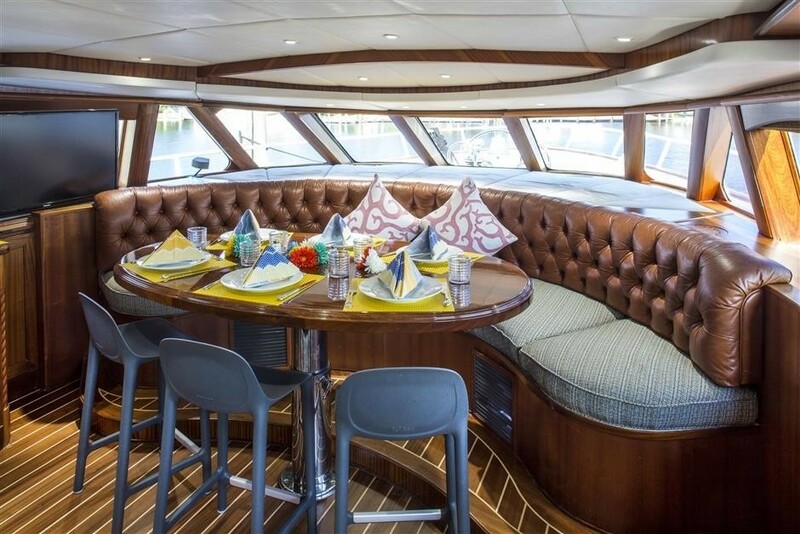 WATERCOLOURS received an extensive refit in the summer of 2007, which included a complete remodelling of the main deck and the transformation of the previous formal dining salon into a country kitchen with panoramic views forward and dining for up to 10 guests. 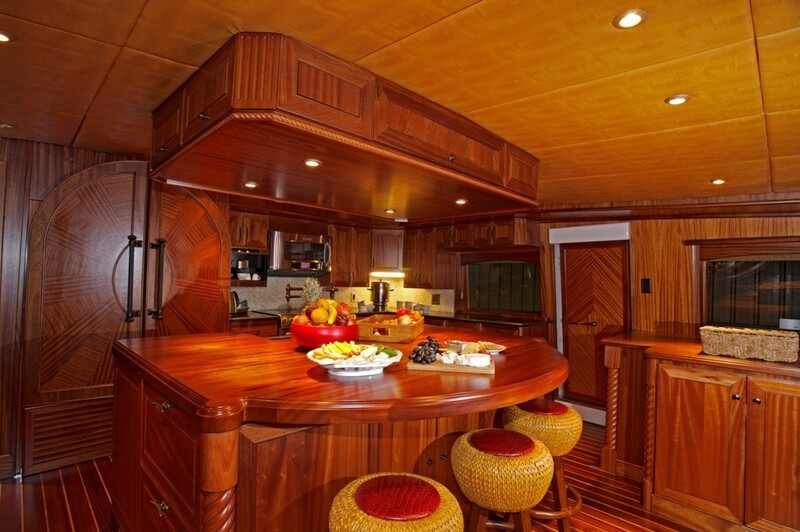 Sepeli Mahogany and teak were incorporated, as well as luxurious silks and leathers. 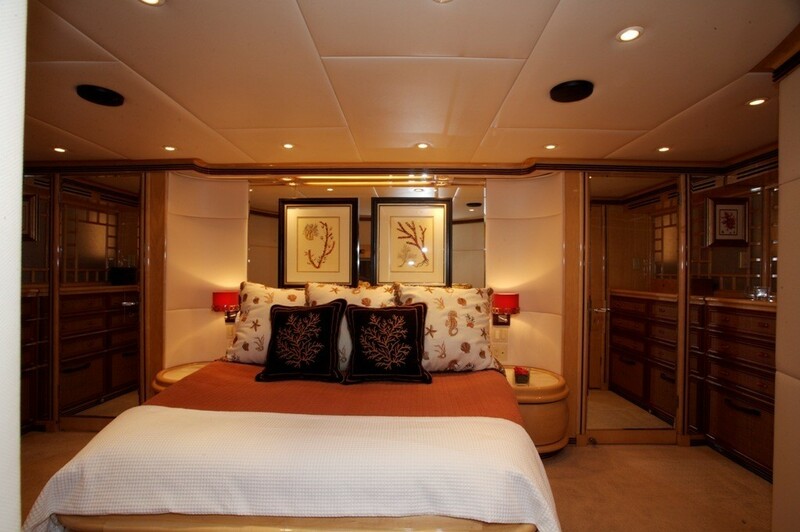 The yacht can accommodate 8 guests in double staterooms. 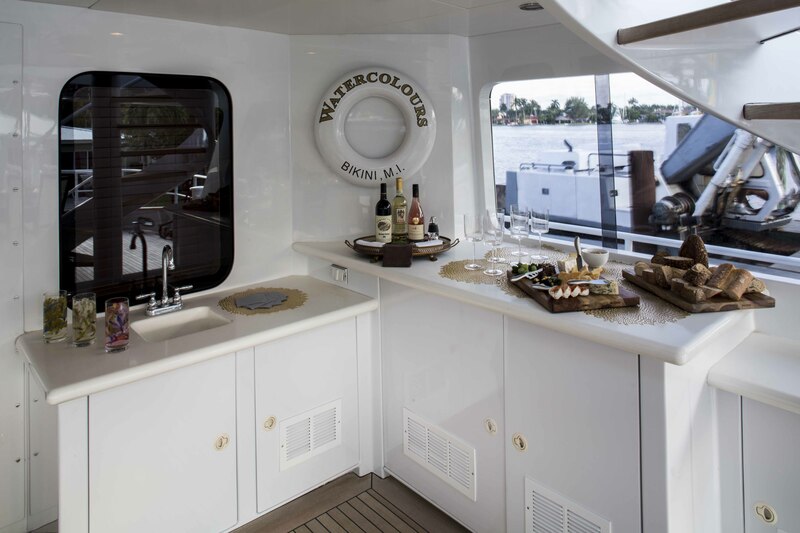 WATERCOLOURS is equipped with an great selection of water toys, including 2 tenders, a jet ski, spa pool. 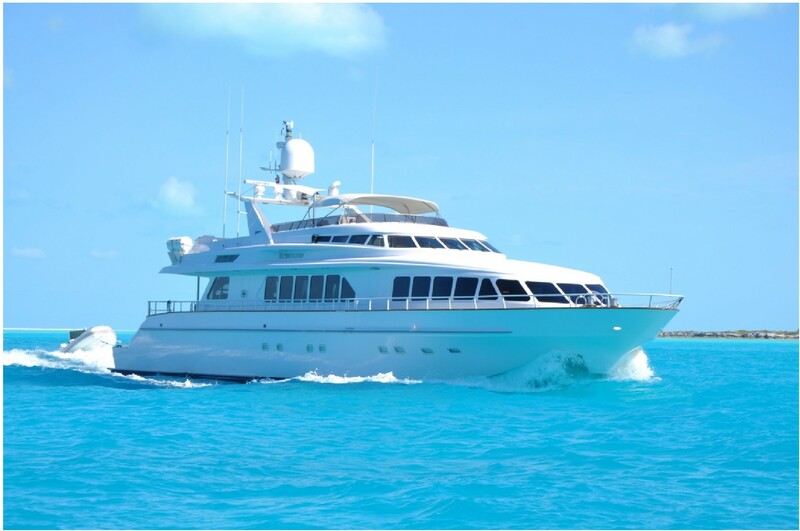 WATERCOLOURS has a crew of 5 and is based in the Bahamas in the summer and the Caribbean during the winter months. 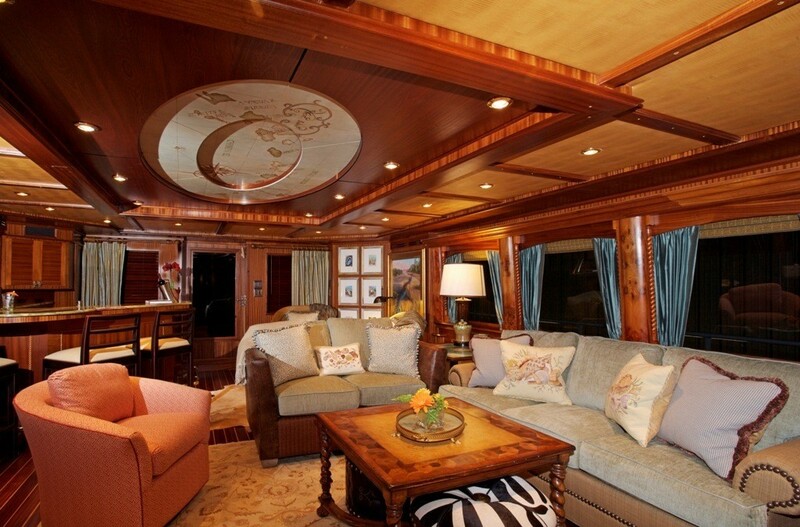 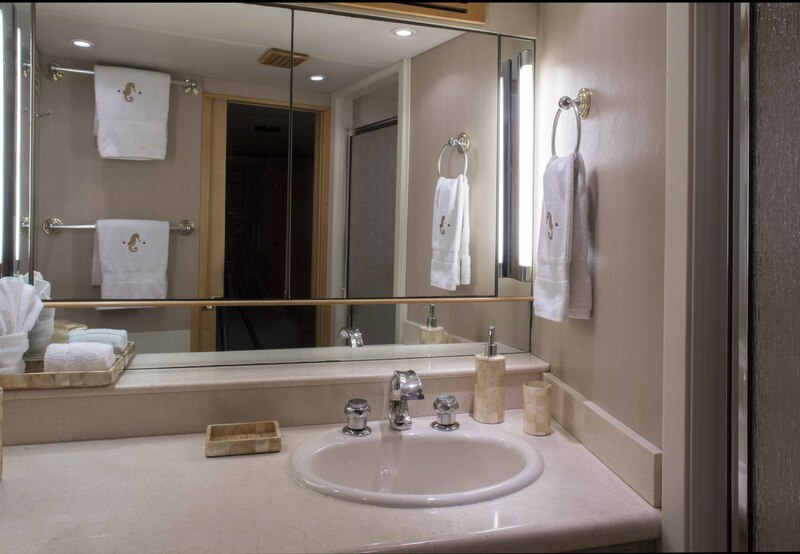 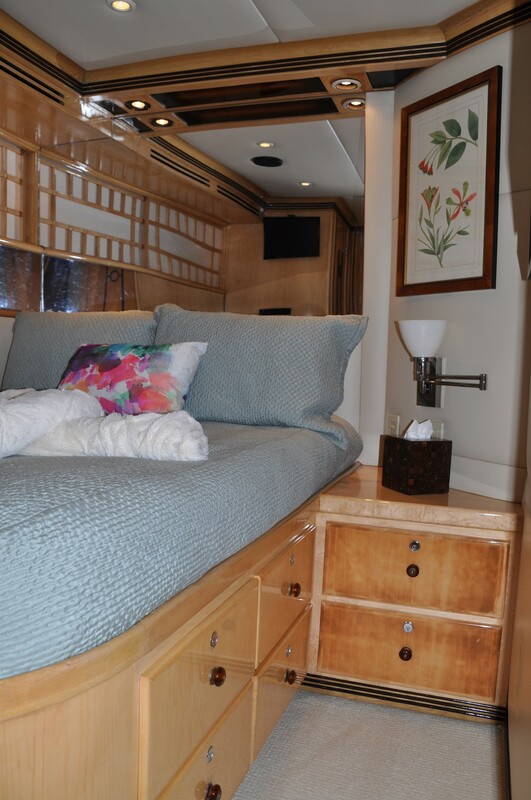 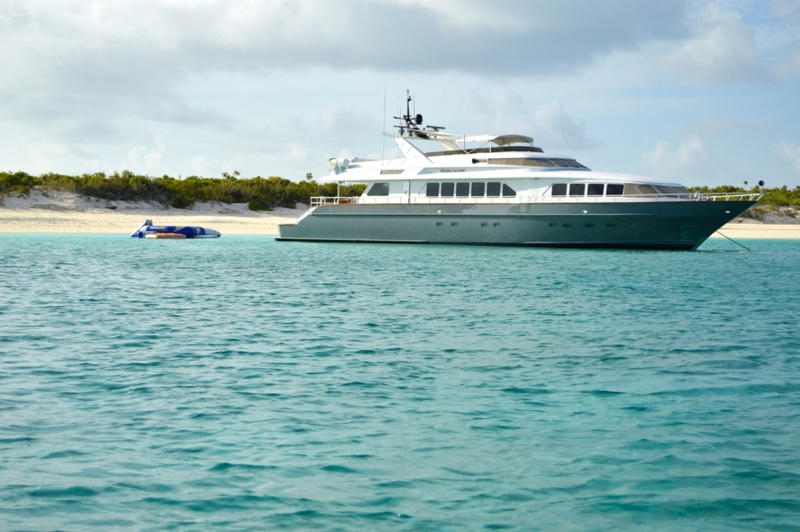 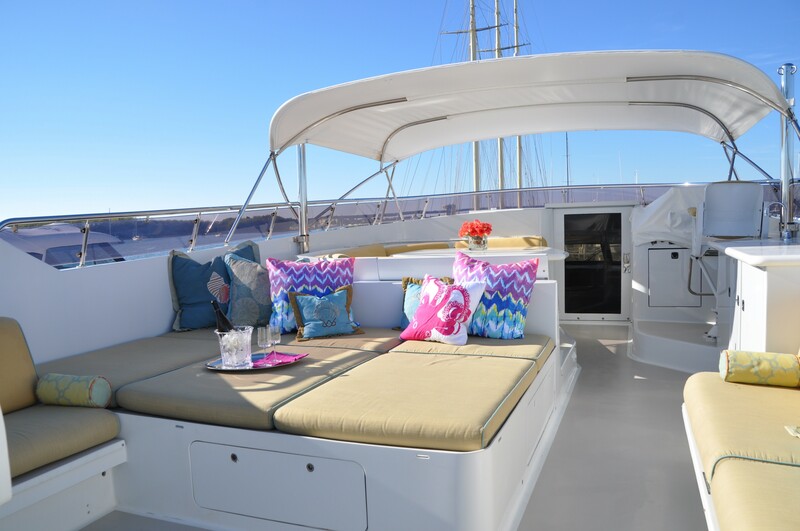 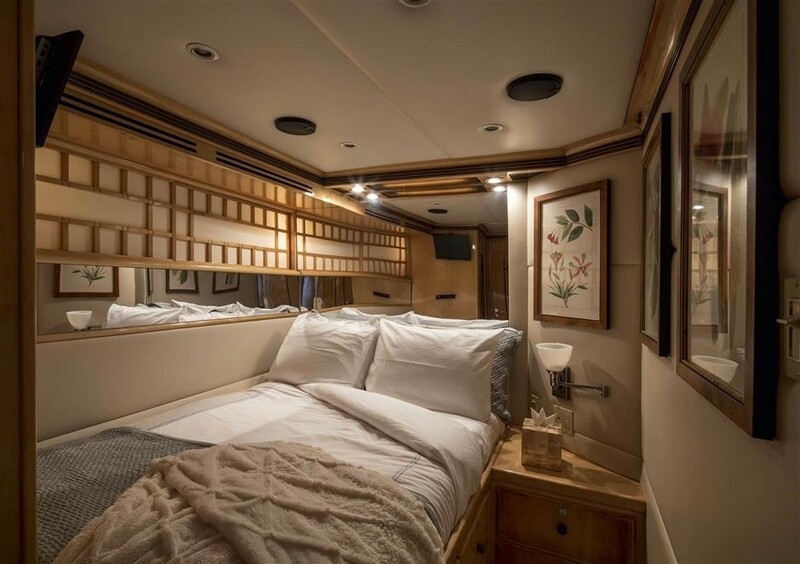 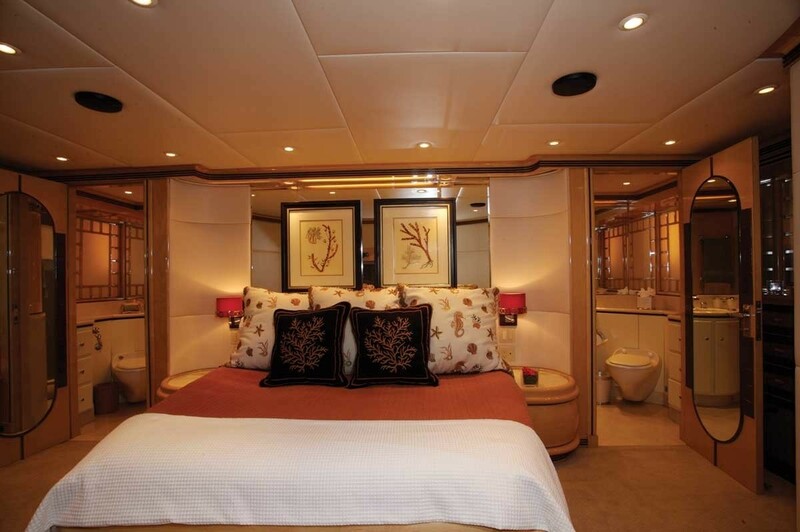 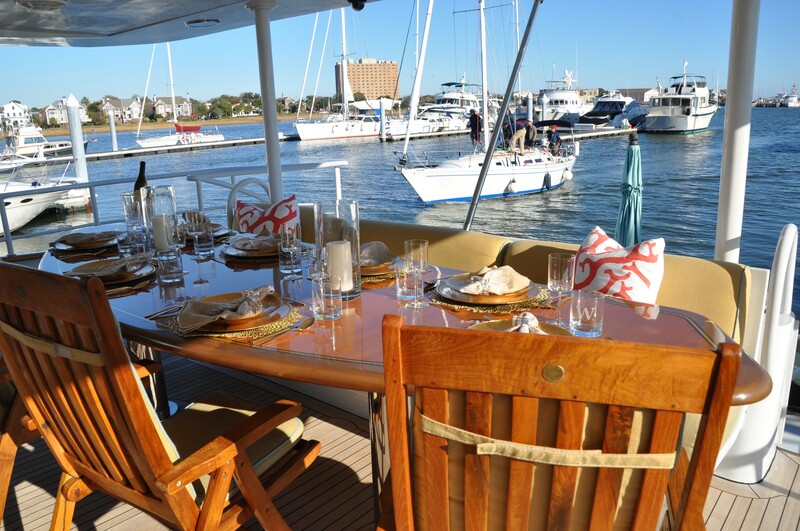 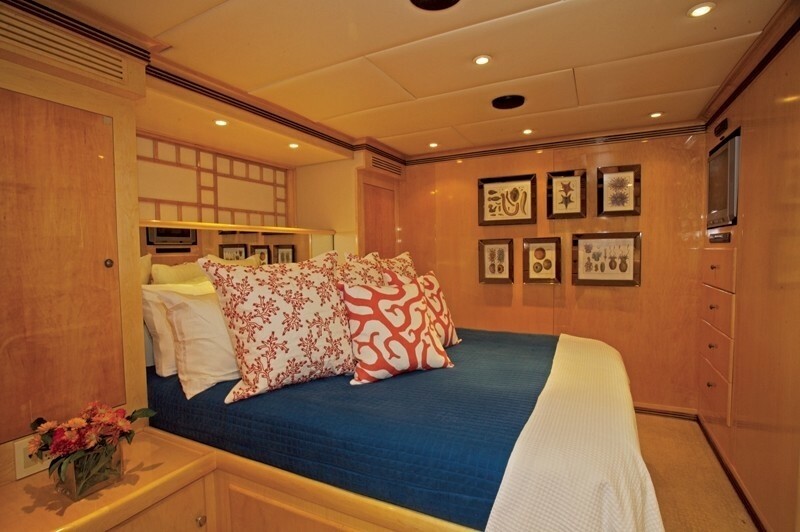 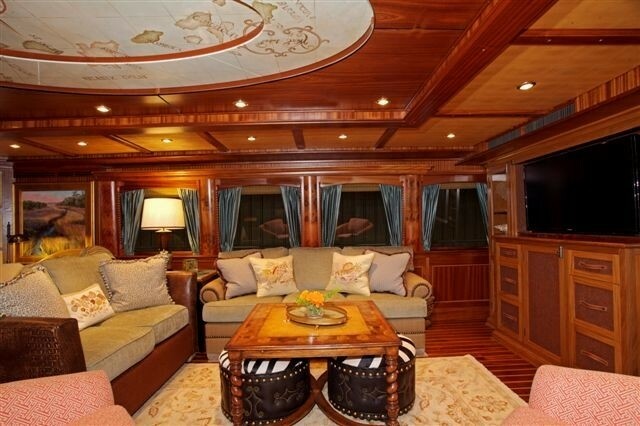 Motor yacht WATERCOLOURS can accommodate a total of 8 guests in 4 double staterooms. 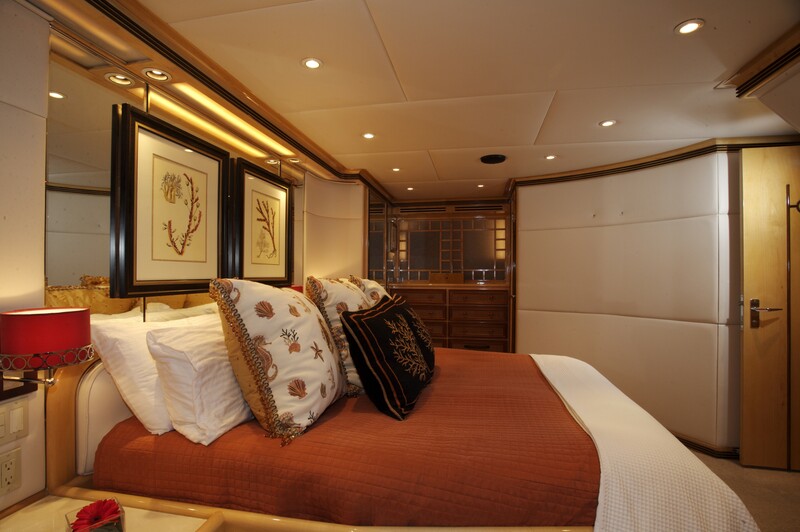 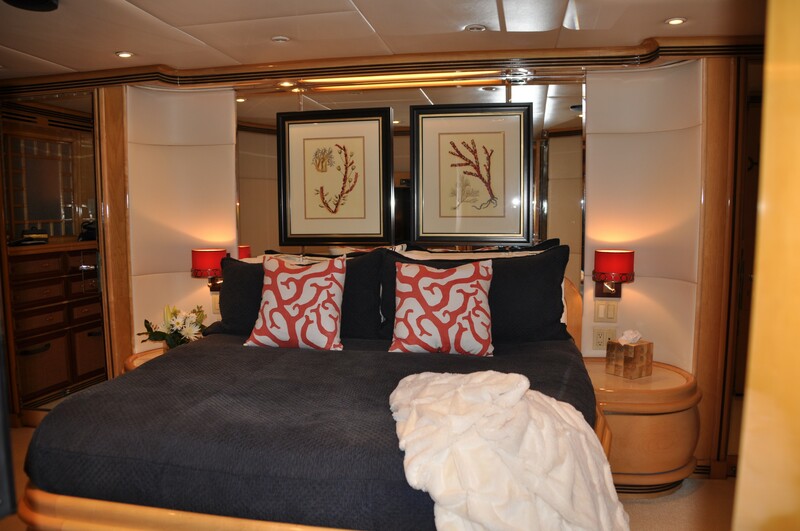 The Master Stateroom features a centreline queen size bed and a full entertainment centre with flat screen TV/DVD. 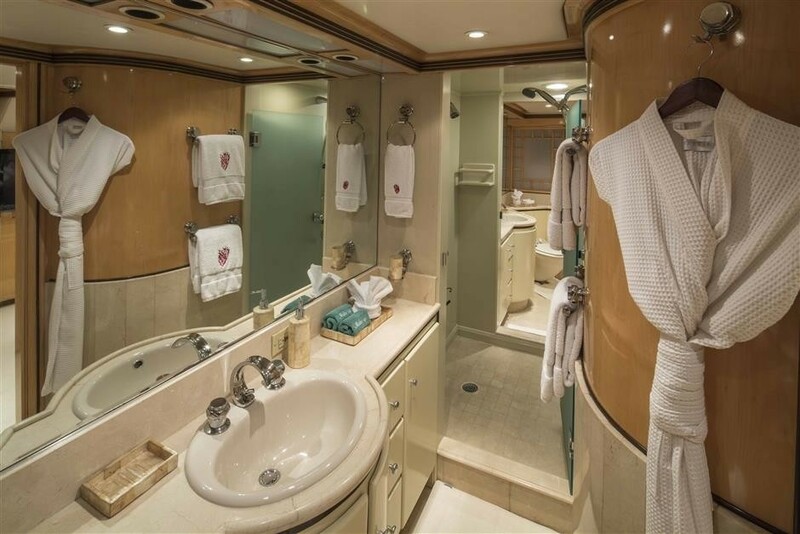 The en-suite features his and her facilities separated by a large double shower. 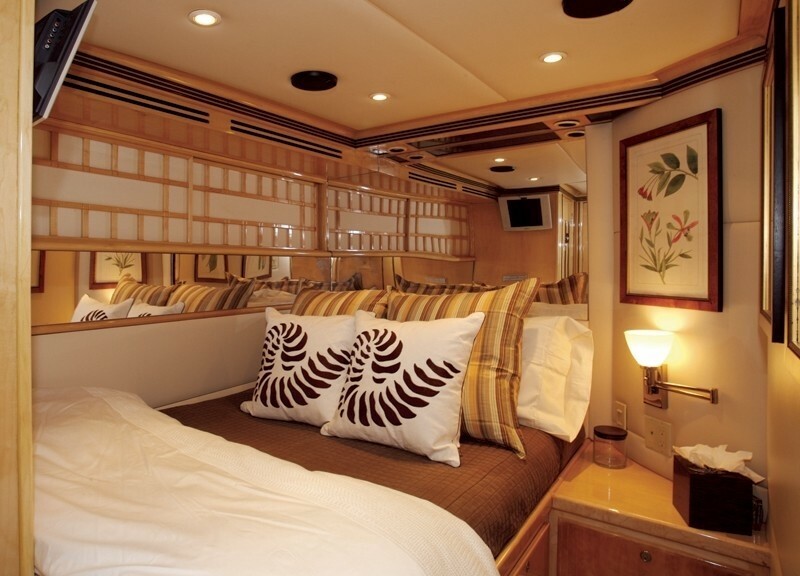 The VIP Suite has a walk-around queen bed and entertainment centre with flat screen TV/DVD/CD. 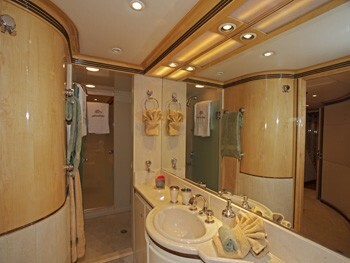 Plus ensuite facilities with a stall shower. 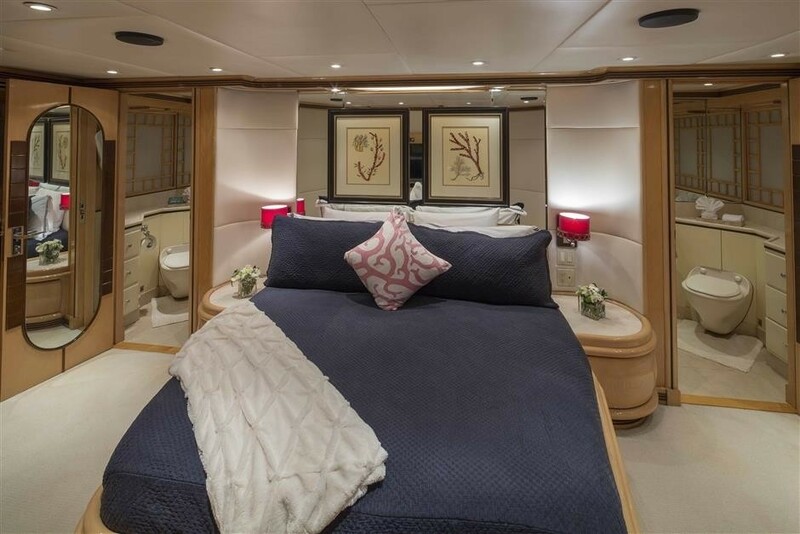 There are 2 additional guest staterooms each with a double bed and an entertainment centre with flat screen TV/DVD, and en-suite with shower. Motor yacht WATERCOLOURS has a great selection of extras onboard including the following Tenders and Toys: A 32’ Boston Whaler, a 18' Novurania tender with130hp, a 3-person SeaDoo, an 8-man Brownies Third Lung, Wakeboard, water ski’s, Snorkelling gear, Inflatable tube, Fighting Chair in cockpit, Fishing gear Trolling: Rods and Reels, Fishing gear Spinning: Rods and Reels, Beach Toys, Board Games and books, an on Deck Spa Pool and Sun Pads. 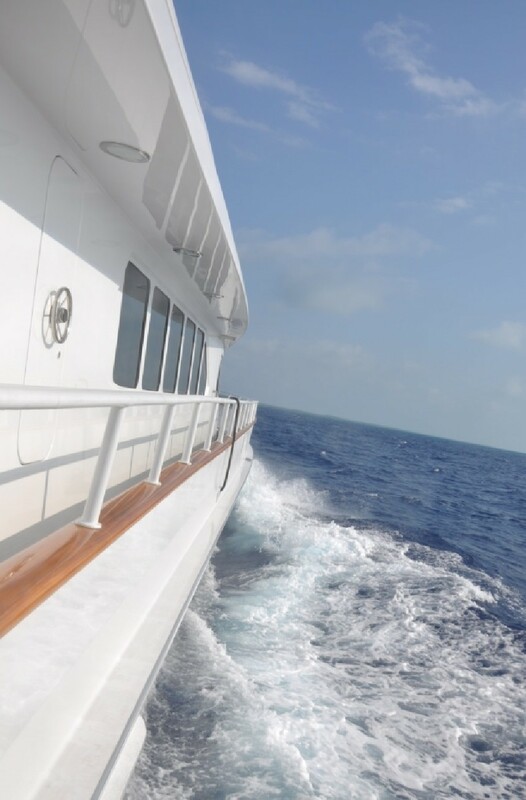 Communications include SatCom/SatFax, cell phone, SSB, VHF, wi-fi internet access in port, printer/scanner/copier/fax. 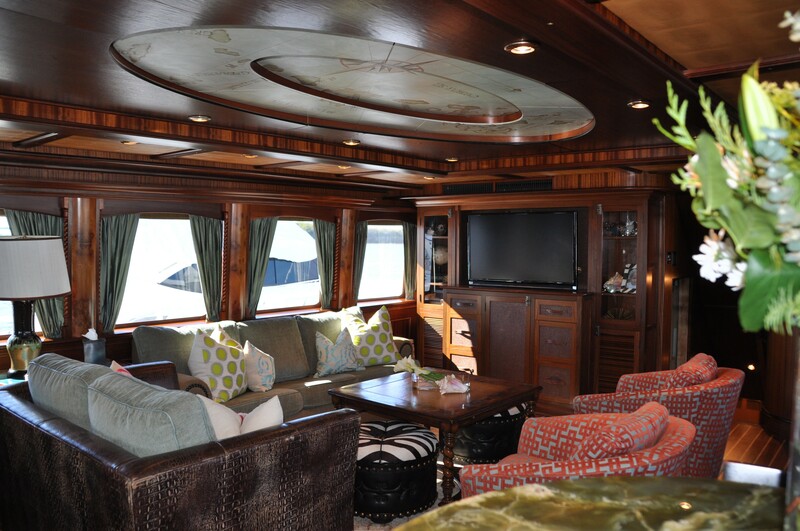 Audio Visual Equipment and Deck Facilities include DIRECT TV with 9 receivers, DVD, CD, surround sound, audio visual library.